With December nearly at an end, I wanted to make good on a promise I made back in late October when we introduced you to the madness of National Novel Writing Month, in which thousands of people try to write 50,000 words of a novel in the month of November. I participated for the third year in a row and crossed the finish line with a few days to spare. Now that I’m somewhat rested from that huge disgorgement of verbiage, let me explain the photo that accompanied my blog entry about NaNoWriMo, which showed me reading a copy of the book I wrote from November 2006 through February 2008, including two 50,000-word-long NaNoWriMo sessions. The day I finished the first draft of the book, I decided I wanted to have something tangible to commemorate my accomplishment. But more than that, I wanted a few trusted friends to read what I’d written and tell me the truth, good or bad, about what I had written, so that I could make the second draft of the book better. Rather than print out hundreds of pages of manuscript on my printer and run it down to Kinko’s, I decided to take advantage of a print-on-demand book service. For various reasons (including familiarity, since we used it to provide print-on-demand services for our very first Superguide book), I used Lulu.com. Lulu provides a wide selection of book types to choose from. For my first draft I chose Lulu’s Pocket size, which is slightly larger than a mass-market paperback (and printed on better paper than one): 4.25 inches by 6.9 inches. Lulu provides margin settings and even a blank Microsoft Word template so that you can get the size of the book just right. 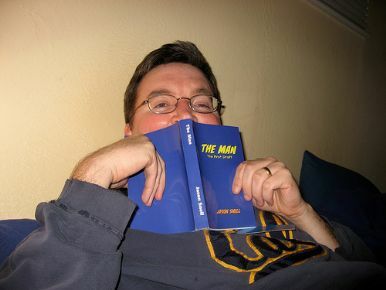 The author attempts to hide his gruesome disfigurement behind the limited-edition paperback of his novel's first draft. So I exported my story text from Literature And Latte’s Scrivener ( ) and opened it in Word, created a custom paper size, set all my margins per Lulu’s instructions, added headers and footers, and then printed to a 435-page PDF, which I uploaded to Lulu. The total cost for those books, including shipping: $17 per copy. Not cheap, I know, but I was willing to splurge in order to have a real souvenir of the process and give my readers something that felt like a real paperback book. My order shipped within a few days and in a few more days, the books arrived. I passed them out to my readers, including one friend and colleague who is a remarkably good editor—she marked her copy up like a college student frantically marking up a textbook. Her comments were invaluable. I realize this process isn’t for everyone, but I had such a good experience with it that I repeated it once I had finished my book’s second draft. This time I ordered a larger size, Lulu’s U.S. Trade (6 inches by 9 inches), which made my book 318 pages long. I think maybe I prefer the smaller trim size of the first book, but it was fun to experiment with a different look for this book that may or may not ever actually be published by a reputable book publisher.